The metastable zone width provides essential information for developing well-controlled crystallization processes. The gathering of the underlying solubility data traditionally relies on labor-intensive techniques, which is why these data are often not available. With the Crystal16™ and CrystalClear™ software, scientists have now one integrated package providing all the tools needed to easily determine the metastable zone width. 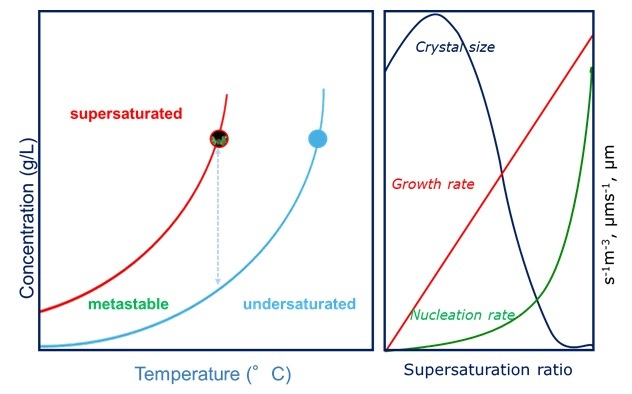 The metastable zone width is defined as the zone between the solubility curve (clear points) and the metastable limit curve (cloud points) and provides essential information for developing well-controlled crystallization processes. The Crystal16™ is the commercial crystallizer unit with integrated turbidity measurement to determine cloud and clear points.